TORONTO, July 27, 2012 – The Canadian Olympic Team will step onto the world stage in a sea of red today as they proudly unveil their official parade uniforms at the London 2012 Opening Ceremony. Canadian style has always been about fashion and function. 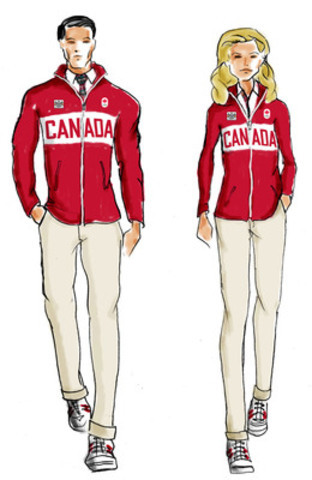 Created by The Hudson’s Bay Company, the standout bright red Canada Parade Jacket was designed for the conditions in London where the athletes are set to compete for the next 16 days and features a Canada wordmark in white and red across the chest that was inspired by the 1976 Montreal Olympic Games for their sporty colour-blocking concept. The jacket is layered on top of tailored white dress shirts that feature the official Canadian plaid on the placket for women. The men’s ties are a show of respect to the formality of the Parade and the Games and also feature the same Canadian plaid. Tailored khakis and sporty white sneakers complete the full look. Canadians and fans of Canada abroad can sport the Team’s Opening Ceremony look with the Hudson’s Bay Company’s replica version of the jacket, available in red, black and navy in men’s and women’s styles. The entire 2012 Olympic Collection can be purchased online at Thebay.com and is available at all Bay and Zellers stores across Canada until September 2012. The London 2012 Canadian Olympic team consists of 277 athletes, 93 coaches and approximately 100 mission team staff. Team members will each receive 29 items as a part of their uniform including jackets, pants, leisurewear and accessories. Accessories range from backpacks and Ray-Ban-influenced sunglasses to baseball caps with patches and summer toques. Hudson’s Bay Company, founded in 1670, is North America’s longest continually operating company. The company comprises The Bay, a major department store, Zellers, a mass merchandise format, and Home Outfitters, a kitchen, bed and bath specialty store. With nearly 500 retail outlets and approximately 50,000 associates in Canada, Hudson’s Bay Company banners provide Canadians with stylish, quality merchandise at great value and with a dedicated focus on exceeding customer expectations. The Hudson’s Bay Company’s US banner operations include Lord & Taylor, an upscale specialty retailer with 48 stores across nine states, with two new stores opened in Spring 2012. The company also operates 3 outlet stores, Lordandtaylor.com, and two Lord & Taylor Home stores. The Canadian Olympic Committee is a national, private, not-for-profit organization committed to sport excellence. It is responsible for all aspects of Canada’s involvement in the Olympic movement, including Canada’s participation in the Olympic, Youth Olympic and Pan American Games and a wide variety of programs that promote the Olympic movement in Canada through cultural and educational means. For news and information, visit the COC website atwww.olympic.ca and find the team on both Facebook (Canadian Olympic Team) and Twitter (@CDNOlympicTeam).